You can see these vidéos here by clicking on the sign "play". But this reading is in lower quality. If you wish to visualize these clips in higher quality, MAKE A NEW CLICK on the screen of the video and you will be redirected to YOU TUBES where you will be able to choose the option in bottom on the right of the screen "watch in hight quality". The public is astonished and admiring when it attends this act of procreation between the sun and the EARTH, prepard by the man, became at time of the ceremony, the catalyst of fecundation. 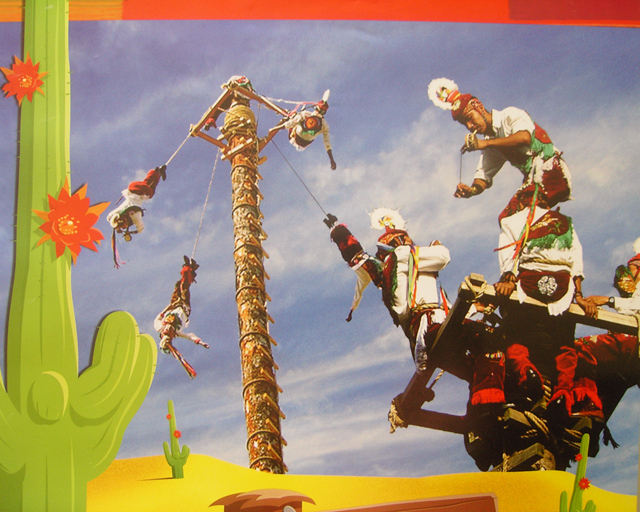 SEE ALSO THE PART " AZTECS FLYING MEN IN BEACHES TOWN "
The tree is the phallus which penetrates the Earth. The man who dances at his top sending his vibrations in the centre even of the Earth. The rays of the Sun appear then to fertilize corn seeds integrated into the moisture of the Mother Earth and to thus obtain heavy crops. As in our European provinces, as us therefore, they fight for the safeguarding of their identity. This rite is not folklore but well a demonstration of fusion between the human being and the elements of nature: Sky, the Mother Earth, Sun, Water, Wind, and life even of the Flying Man, whom it gives between the hands of the Gods during all the ceremony. Only this group of Cuetzalan, interprets this rite in all its symbolic system. And it is after 17 years of research that I could find the true direction of this ceremony and to give him all its importance for the modern world... it is what makes of it an immense success near the public. When Spanish arrive in 1519 at the conquest of Mexico, they discover on their way coming from Cuba, of many very developed civilizations autochtones. Their laws often precise and are well established. Their religions are impossible to circumvent. And yet, Spanish qualify them barbarians and destroys sites, constructions, documents in the name of the queen as regards the material richness and in the name of the Christian faith, for the monk. Transformed into slaves, the Indians must build the churches, convents, palate and haciendas. They become a free handwork in the fields of sugar cane. Forced with the point of the sword to change their beliefs and to Christianize themselves, they mix their religious concepts with that of the monks to survive. Thus one finds today still many religious rites in the honor of many catholic saints. They thus hide of course the beliefs in their ancestral gods who, each one in their place, bring the benefits necessary to the best course of the everyday life. Each saint has one or more tasks to achieve, for example to make rain, carry chance or cure. But thanks to the pride and value of each one, during centuries, the traditions of yesterday could survive and find certain aspects of their origins. More enquiry, more setting with died for heresy, the men are free to perpetrate their past and the ceremony of the Flying Men in is an example of most outstanding. This ceremony proceeds in the states of Veracruz, Hidalgo, Tlaxcala and Puebla. 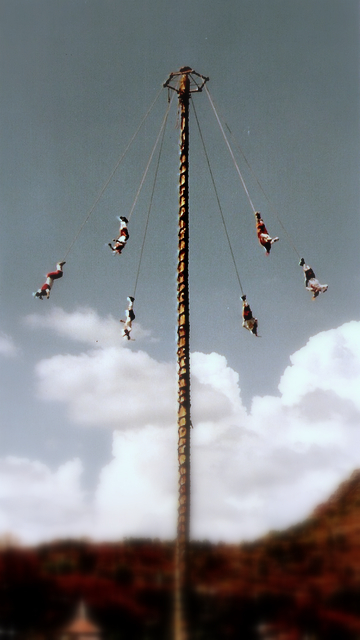 For its impressive image, the ceremony "the Dance of Volador ( Flying Men)" however is popularized in Mexico, and in particular since Papantla in the state of Veracruz which made known it with the tourists by presenting it in Mexico City in front of the museum of anthropology or in the tourist centers. To facilitate the presentations, they even obtained PEMEX, the company of Mexican oil, pipes for pipeline, which welded between them form the 34 m height mast, made of steel!!! Of course, the tradition is lost with the profit of the spectacle. NO more tree wire of nature, no more phallus fertilizing the Earth, but only one financial spectacle without heart to satisfy the town national or international walker... But in more back areas, in villages less reached by tourism, certain men still defend the past of their parents. It is the case of this school of the area of Cuetzalan, in the state of Puebla. Small village, developed at the side of a mountain, often covered with fog, formed by the low clouds which are numerous in the zone, Cuetzalan is still the center of life of all this coffee area of the sierra nahuatl. Nahuatls are downward the Aztec ones. 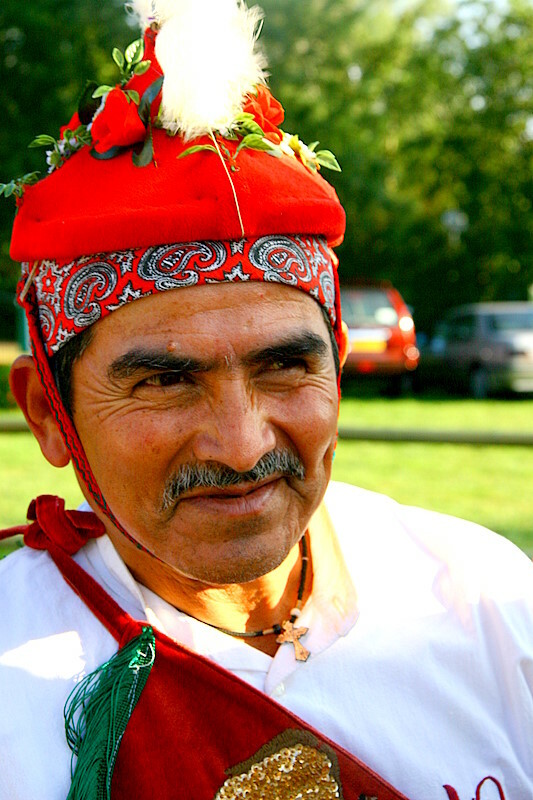 They speak the nahuatl, the language of the Aztec ones. Their costumes and habitats are still traditional. Cuetzalan, in Nahuatl means "Land of the Quetzal" this tropical bird with multicoloured plumage of which the long green and silky tail permitted the manufacture of the large plumes panach of the Aztec emperors. ... It is on October the 4th and December the 8th and 12th of each year which, in Cuetzalan, the ceremony of the FLYING MEN, called Cuatatini or Tlatini, is carried out, which is translated nahuatl with Spanish by "AGUILAS IN DECENSO" or "the DESCENT OF the EAGLES". This points out to us the importance of the eagle in the Aztec culture. This eagle posed on a cactus with a snake in its nozzle, which is the symbol of Mexico. It direct messenger of the god Sun would be it? 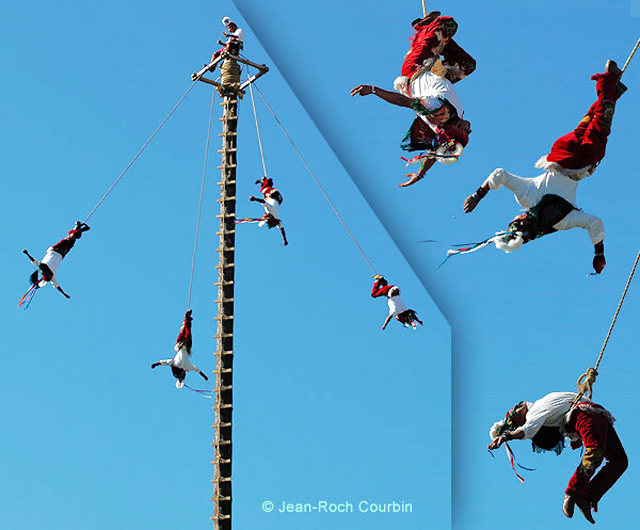 In fact, at the time of this ceremony, you can see the descent of four Flying Men attaches with a cord, the head towards the ground, and who turn around a 34 m height mast, the cord lengthening while being held slowly with each revolution, to join the ground since its higher part. A fifth dancer, the Corporal, will have with the precondition danced on the top of the mast by playing at the same time the traditional music on a small drum and a flute of reed, symbol of the time which passes. What can mean all that well? It is in fact a ritual in the honor of the Solar Disc, for the Aztec ones, God of our System, within cosmos. 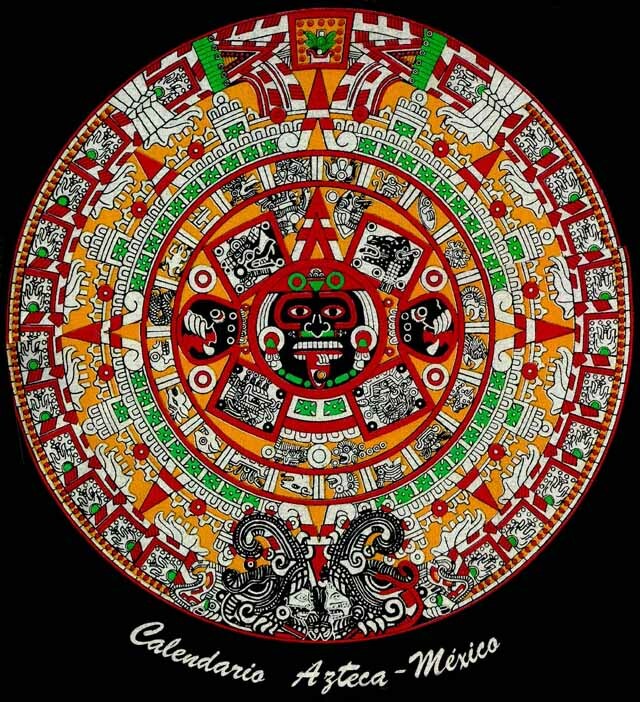 The Aztec calendar, large stone of more than 3,50 m in diameter, discovered in the town of Tenochtitlan, (MEXICO CITY) with the arrival of Spanish, describes us the importance of the sun in this culture, warlike certainly, but so full with art, of music, philosophy and of true poetry. ... One needs a tree of at least 40 m height to keep, after its setting out of ground, at least 34 meters. Indeed 3 plus 4 is equal to 7, which is today, the number of one week days and well other symbols still. Once the tree chooses officially, several hundreds of people will come to go following day to attend its cut and to transport its 40 m and 2 tons by hand, hung has ropes being useful of supports, by the mountain lanes towards the center of the village, in front of the church. Each five dancer, will have with the precondition turned seven times around the tree in music, striking seven blows of axe to him each one before cutting down it. It will be cleaned of all its branches to preserve only the trunk. This tree has as a name nahuatl: PAPALOCUITLO. Transferred onto the place of the village, one will fix at it wood cross-pieces which will be used as support to assemble at the top once this one set up vertically in a hole from approximately 3 to 4 m of depth. These cross-pieces represent with the trunk the vertebrae of the human skeleton. 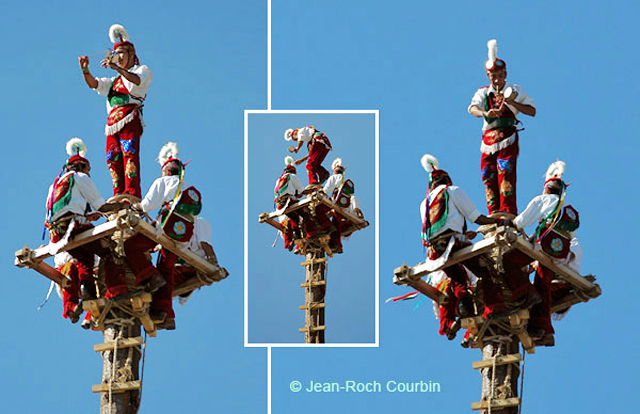 The five Flying Men, equipped with costumes, red, green, white and yellow, will go up at the top of the 34 m after having interpreted a ceremony in music with its feet. Once installed at the four points of the platform, the fifth upright on the summit of the tree, will interpret like ceremony, a dance in music, the honor of the four cardinal points, divided into four distinct parts. The first phase will call the spirits of the sky. It will be carried out lengthened on the top of the tree in balance to horizontal, in direction of the male elements of the Sky: Wind and Sun. The second phase will allow the man drawn up upright on the tree of dance by striking feet to use the tree like amplifier. It thus sends the vibration of these blows to the centre even of the Earth to call the female Gods of the basement there. The third part, whereas the Gods of the Sky and the Earth, the male and female elements, with their call musical and aesthetic, the complaints of the Flying Men, a such prayer, in order to obtain benefits necessary to the best course of the everyday life, carry out superb arabesques in order to assemble himself they are brought together to listen to like the Voladore Corporal to the Gods present. The last part, the such symbol of the race of the sun to the top of the horizon, is the flight itself accomplished by the for eagles men. While turning from there, they will launch out then in the vacuum attached to a cord which will be held little by little with each turn. This represents the survey of the sun, then the dancers turning moreover in further from the center and moreover in low, will be assimilated to the rays of the sun which are épandent moreover in more with length of the day. The arrival on the ground, being of course the symbolele to lay down sun, fallen from the night and the end of the ceremony. It is the true that the feelings of the spectator during the flight can be comparable with the feelings felt throughout one day shone upon, with the slowness of the alarm clock, the morning, then exubérance of the activities along the day, with the deceleration of the effect towards the evening, to arrive at the stop of the conscious life with laying down it, and the sleep. What is also a beautiful summary of a terrestrial life! But of course, we will speak again about it together perhaps on the site of our presentation of Flying Hommes truths of Cuetzalan, since they will be there too to answer your questions with myself as translator at the time of the conferences which we will not fail to present to you. All infos on their come to France on Blog or the calendar from the demonstrations on this Web site. Then made beautiful dreams with the Eagles in Descent, the messengers of the Sun, who will be perhaps a day the center of principal attention of your annual fair, of your animation of summer or one of your festivals. INTEGRAL TEXT OF THE VIDEOS "THE FLYING MEN" This more detailed text will enable you to look further into the former presentation. Before beginning with the presentation of this "dances", because we are talking about dances when we speak about the ceremony of the Voladores, it is important to me to insist on the fact that she must not be considerate as a simple acrobatic show attraction. It is undeniable that all over of this big festive show aspect that she deploys, we must not forget the more initiatory element, more historic and more philosophical in which do this ceremony bath for at least for eight centennial. In a world where more and more for the human being, all is summarized in term of productivity and of consumption, it is interesting, I think, to take part in the recall of the bases of the heart and the spirit, by the memory of creative last times of our real daily life, of philosophy and of poetry, which make us thinking mammals, and thus different from the reign of the simple animal. The choice of this authentic ceremony as animation within the framework of your artistic or commercial events, does nothing but bring this balance between the commercial act and the of the spirit act, essential for the survival and the development of our companies. Your visitors will be thankful to you. 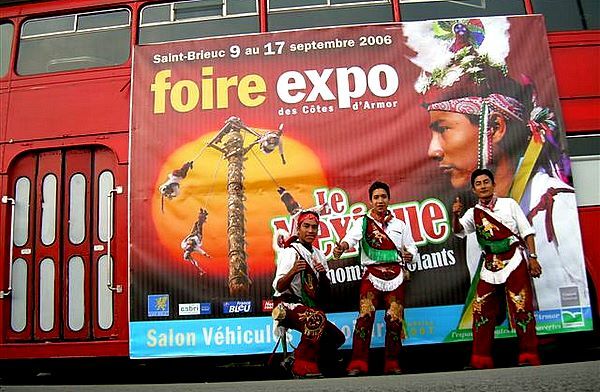 It is for this reason that it would be unthinkable today to organize a trade fair without integrating into it the festive element, which will be even more developing at the same time supplementing it by the cultural element. That’s the importance of this animation on FLYING MEN AZTEQUES of Mexico, balances by excellence between the body and the spirit, based on the communion between Men and nature. On this subject DIEGO RIVIERA, the immense Mexican muralist painter said about the artistic direction of the TOTONACAPAN, original geographical area and realization of this dance: "Their Art has rare quality to mix the purest architectural styles with most long-lived of spiritual realisms"
This artistic expression is represented as a whole by their Pyramid’s architecture since Yohualitchan with El Tajin, the ceramics of the "smiles", the flavour of the vanilla of their arable lands or precisely the initiatory dance of the VOLADORES. Thanks to these poetic images which stimulate our imaginary, we are now well within the heart of our topic. 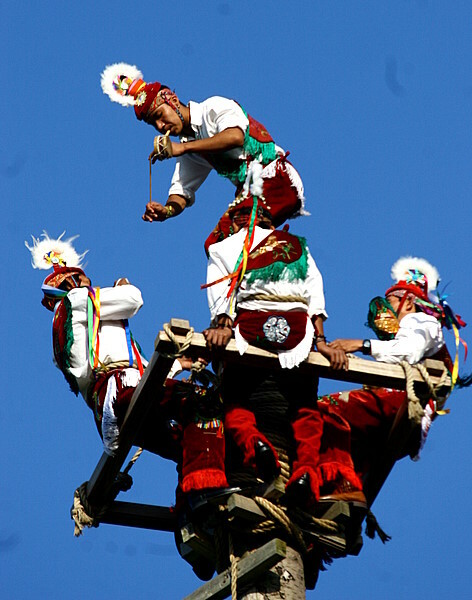 Although presented in its most modern form, the dance of the Voladores reflects still today the largest respect for its ancestral traditions. It undoubtedly forms part of one of the most complex cosmic ceremonies and symbolic system which are celebrated in the world. The monk Torquemada, companion of the conquistador Hernan Cortes says in his relations of America that "Voladores" were not any Indian, but those carrying the knowledge of the mystery of this initiatory ceremony. 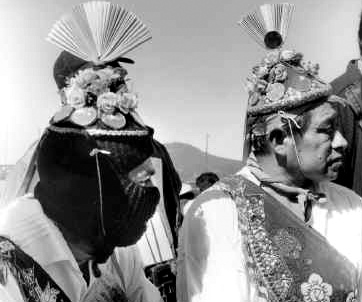 This ritual, is probably originating in the central mexican altiplano, the MIXTECA. Then it was adopted by Toltèques de Tula, close to the valley of Mexico City, which, later in a version reduced of only 2 participants export it towards to Guatemala and Nicaragua. Because if among the Aztec the flight is carried out with 4 Men Birds, at the beginning of the Spanish conquest it were carried out by six Voladores as it was still the case some time ago in Cuetzalan and Atlixco, from where are originating the members of our team. You can recognize there Jorge Baltazar, the Voladores Master and some of its pupils, with reports on its work realized over several decades. After having carried out the choiced ritual, from demolition, transport and transplantation of the trunk with great reinforcement of music and offerings, they always begin their ceremony with the "Sound" of "Forgiveness". They obviously must with the precondition of the rise towards the top located at 30 m height, to ask "Natural Mother" to forgive them "to take away a son", this beautiful tree, here a Douglas pine cut down especially for the ceremony. It is at time of Aztec and the conquest that the music replaced the offerings. This ceremony is related to the Spring Rite. It was carried out for the 21 the Mars equinox, always marked still today in each indigenous commune by the election of a Spring Queen. The flight symbolizes the celestial origin of the food plants, and has ancestral bonds with the Corn cultures, closely connected with America today known as Latin. It formed integral part of the ceremonies in the honour of the divine spirits related to the course of the everyday life, accompanying the captive sacrificed warriors by gladiatorial rite or sifting of arrows slowly stripped in all their body. These sacrificed went up to the sky to join God Sun to return on ground in the form of birds or of butterflies. The return of these downward warriors of the sky was thus symbolized by this flight of Voladores. At the conquest time the human sacrifices were prohibited. From where in its current form ceremony, become a whole and more complete in its basic symbols. It connects the man, priest, half God for the time of the ceremony, with the spirits of nature. 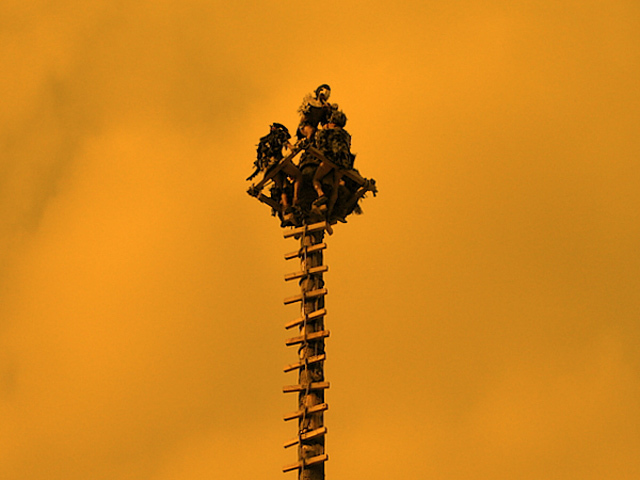 Voladores make the offering risking their life to call, like and heard in their prayers by the forces of the Sky and the Earth. The rise is vertiginous along the trunk which symbolizes the male element by excellence. It is the immense phallic hyphen between the sky and the ground which it penetrates, in order to fertilize corn seed, bases even life of these people, by connecting the male elements top: sun, clouds and wind with the female one of bottom: the water of the ground, in an act sublimates procreation of nature. The height of the trunk, flanked by a wooden square, indicates 4 cardinal points. It supports 4 ropes attached to 4 Voladores and who connect them with the life. The Caporal, the fifth element, slept or standing at the end of the trunk, always beginning by the East, and successively in the direction of 4 cardinal points, will address the spirits in this ceremony divided into 4 parts. The first phase slept on the tree in the horizontal calls the forces of the sky. You should forget none of the spirits which could get angry and create an incident. It is necessary to realize thus necessarily this call in 4 horizontal directions, the Sun King, watching the whole, placed just above the body of the man bathed by the beams of the light and of the breath of the wind. Four periods of 13 years are symbolically present which multiplied by 4 give Suns 52-year-old Aztecs, the unit of time of their calendar cycle. As for the men they represent eagles, quetzals or the other butterflies come back from the sky towards their original earth. 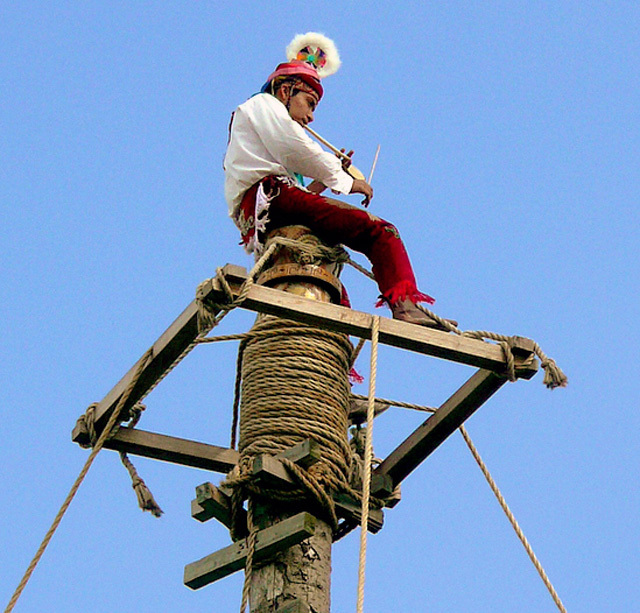 The corporal staying on the top of the tree offering his body in offering to the beams of the sun, will come down later being allowed sliding during the rope continuing his exploit and offering in offering the risks of this ceremony to the spirits of the nature. But let’s return to our description of the ceremony. The second part, by the rhythm of the dance consisted among others of jumps on the summit of the tree and by the development by the trunk of the vibration produced by jumping and which slides in strongly in the ground, allows to draw the attention of the telluric spirits: feminine so joining male, yets, here present. The spirits of the sky and the earth are present. The third part can then take place to show them the courage of each of the men in the service of their people: it is a back curve realized by the Corporal always in four cardinal points … We make beautiful, we want to please the Gods and we realize at the same time as the prayers which will help to obtain the good growth of plants, coming of the rain or cure of the patients of the community. There are two sorts of different suits to realize this ceremony. On the classic suit of numerous symbols in connection with the nature reminds the fissional sense Voladores with spring and revival of the life. The small mirrors symbolize the sunlight and the fringes its beams. The ribbons of hairstyles are in the colours of the rainbow. They play with the wind and the crown of headgears is the representation of the sun disk. This suit was adopted at the time of the conquest by Indians after the ban during a generation to realize this ceremony for religious causes. In the resumption of this one, again authorized as a game this time by the too gullible monks, the Aztecs adopted this velvet suit just like the suits of the conquerors come from Spain. In a subliminal way and in secret, the red colour calling back them the blood of the sacrifices. We are one of the rare groups to be stolen with the ancient suit of bird used before the conquest. This suit was reconstituted by Jorge Baltazar, the "maestro" on the models represented on the Aztec codex. Without the human sacrifices, but with the music of flute and of "tamborcillo" find now the spirit of pre-Columbian period. This music played during all the period the name-days in these regions, is interpreted on a flute with voice of bird in three holes and a tiny drum which marks in the infinity the rhythm of the perpetual time which passes by. VOIR AUSSI LA RUBRIQUE " LES HOMMES VOLANTS EN STATIONS BALNEAIRES "